Even though the spring selling season was disappointing, new figures suggest that the nation’s recreational boat industry could be poised to sell more of the boats that produce the most profit this year than it did in 2012. 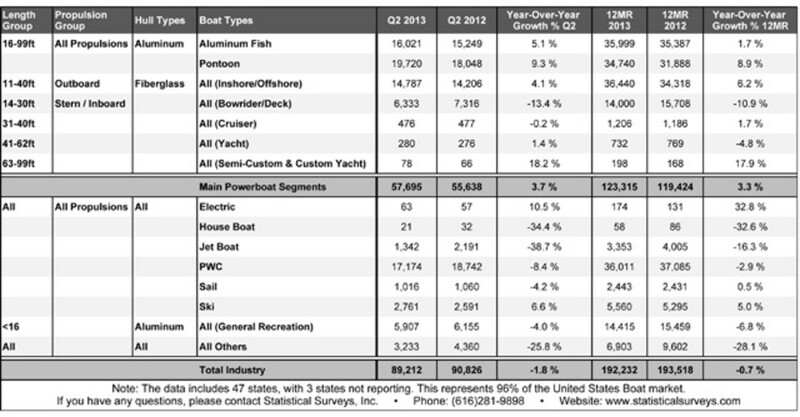 Second-quarter sales in the industry’s main powerboat segments, which include aluminum fishing and pontoon boats and fiberglass boats ranging from bowriders to large yachts, rose 3.7 percent to 57,695 boats from the same quarter a year earlier, Statistical Surveys reported today. The second-quarter data are for 47 states, which comprise 96 percent of the national market. They leave out only Illinois, which is not included because of data entry delays, and Hawaii and Illinois, where data are only available annually. The results for the quarter left the main segments with a gain of 1.3 percent, or 1,014 boats, at 80,151, for the year through June from 79,137 a year earlier, when sales were rising across the industry. For the year through June, pontoon sales totaled 23,979, a gain of 1,632, or 6.8 percent, from 22,347 a year earlier. Among small to mid-sized outboard boats, sales climbed 3.3 percent, or 742 boats, to 22,643, from 21,901 a year earlier. The two categories have been among the industry’s top performers since the industry began to recover from the Great Recession. Sales of 63- to 99-foot custom and semicustom yachts were up nine through June at 113. Industrywide sales were 1.8 percent lower in the 2013 second quarter at 89,212 boats, but that was an improvement from the first quarter when they were 8 percent below their 2012 pace. Through June, industrywide sales were 3.5 percent lower at 121,156 boats, reflecting the difficult spring selling season. Sales surged in July in 31 early reporting states, rising 18 percent in the main segments and 12.9 percent industrywide. Figures for August are due soon.